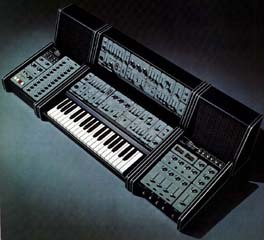 The Roland System 100 is a semi modular synthesizer system. 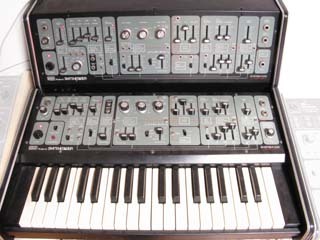 You find a good description written by Peter Forrest at http://www.synthmuseum.com/roland/rolsys10001.html. I own the synthesizer 101, the expander 102, the mixer 103 and the sequencer 104. You will find here the manuals for the four main moduls (I don't know whether there is a service manual for the Speakers 109). These Files are PDF presentations created with Adobe-Photoshop. They will open in your browser and be clickable forward and backward. If you want to use them for printout or manual viewing, then right-click the link and save the file to your computer. The Owners Manuals and the Patchbooks were scanned by Kari I. Keskinen from Finland; I cannot thank him enough for this help! Roland System 100, Expander 102, Servicemanual (33 MB) My copy is missing the page for the parts-layout for the VCF-VCA-Board. 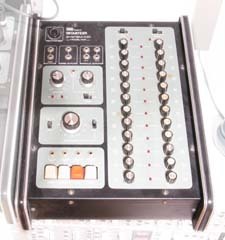 I inserted in this file the page from the Modul 101 here. The board is identically, but the parts for the noise are not installed. Roland_System_100_101-Patchbook_Coverpage.pdf, this is the coverpage of the patch book as colour scan. Some images of my Roland System 100; these are "glamshots", but I did not own the speakers at that time. Some rough shots of the system completed with the speaker cabinets. Some images from cleaning the faders of the Model 101. When I will do a larger restoration more images wi ll follow.